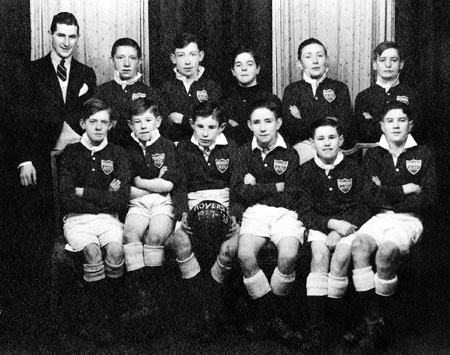 By 1937 they were developing a youth team (photograph 1 ) as well as a junior side. They continued to compete at various levels and featured in many famous games as they put an impressive collection of trophies on the sideboard. Their 1945/46 team included Eamonn Lynskey, Mike O’Toole, PJ Duffy, Paddy O’Brien, Bobby Birkett, Sean Lally, Patrick Folan, Willie Croker, Willie Lally, James Walsh, and Dudley Flaherty. In 1954 they won the Connacht Cup (photograph 2 ). In 1956 their intermediate team played an epic semi-final of the Murphy Cup against Grattan United. It took four games and two periods of extra time (400 minutes ) before deciding that Rovers would go through to the final against Sparks. In 1958 Rovers again won the Connacht Cup. Two years later, a large party from the club went on a tour to Stoke-on-Trent and Coventry. In 1976 the club stepped up a gear when they were invited to compete at senior level in the 1976/77 Bass League Cup, during which they drew with Athlone Town and Finn Harps before losing to Sligo Rovers. In 1977 they joined the League of Ireland and played their first game against St Patrick’s Athletic on August 28 of that year. Chick Deacy scored their first league goal. In September of the following year the minister for defence, Bobby Molloy, officially opened Rovers’ new social club. For six months members of the club had worked hard to convert the Claddagh Hall (which was built in 1912 ) into a sports and social complex, at a cost of £11,000. At that point Rovers had some 200 members, and they hoped this new facility would provide them with much needed revenue in their efforts to establish themselves in professional football. Eventually they changed the name of the club from Galway Rovers to Galway United. Photograph 1 , a youth team from 1937, back row: Josie Owens (chairman ), Sean Cubbard, Joe Reilly, Paddy Lynskey, Martin Walsh, Paddy Cullinane. In front are Patrick Folan, Martin Anderson, Dominick Anderson, Hubert Higgins, Jack Anderson, and Paddy Anderson. Photograph 2 is the Rovers team that won the Connacht Cup in 1954. They are, back row: Paddy Noone, Gerry Ward, John Madden, Tim Griffin, Martin Griffin, Jackie Bohan. In front are Mark Anderson, Noel O’Connor, Michael Joyce (captain ), Martin Naughton, and Josie McDermott. Notice the crests on the jerseys are different in each photograph. Finally , I would like to thank all of those who have supported this column throughout the year with your comments, corrections, and criticisms, and of course with your photographs. It would not be possible without you. Blian nua faoi shéan is faoi mhaise daoibh uilig.